Citrix XenDesktop/XenApp 7.x is lacking on some features or functions that was in XenApp for many years. Personally I don't understand why Citrix didn't build them in the product from day one XenDesktop 7 was released. Now Citrix is just creating workarounds on customer requests. What I'm talking about you ask? As a freelancer, I encounter quite often Citrix pitfalls customer tend to step in. Since I have seen them many times I can quickly fix them to the surprise of the administrator in charge. After the setup of StoreFront you or anyone else cannot login. Delivery Controller are set and everything looks fine. Most common issue: By default, the Delivery Controller TCP port is set to 443 and NOT port 80! XenDesktop Delivery Controller or XenApp are not using 443 by default and therefore will not response to requests. Best Fix: Especially if you run StoreFront on the Delivery Controller - Enable SSL/443 with either a private or public certificate. With Citrix Netscaler 11.0.63 you can configure a StoreFront 3.0.1 specific monitor to check the backend services. Now when you configure the monitor you will basically fail for some reasons. Here is how to do it! 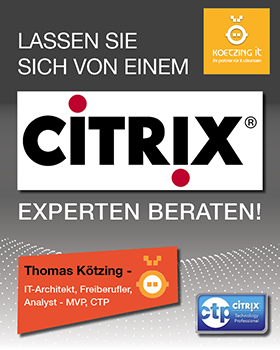 Als Freiberufler treffe ich häufig auf Citrix "Fallen" in die Kunden gerne tappen. Da ich sie oft gesehen habe kann ich diese zum Erstaunen des zuständigen Administrators schnell beheben. z.B: für Punkt 7 wurde fast zwei Tage vom Kunden verschwendet und von mir in wenigen Minuten behoben.